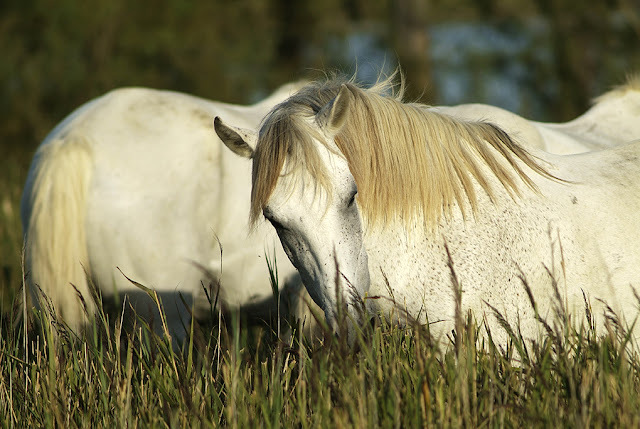 Remi and I had already had a great afternoon in the Camargue, one where we were finally able to push past the tourist tainted scenery into something that made our hearts sing with excitement and feel as if we were both travelers again. It was a day of business and pleasure with the former rounding out the last of the afternoon light. 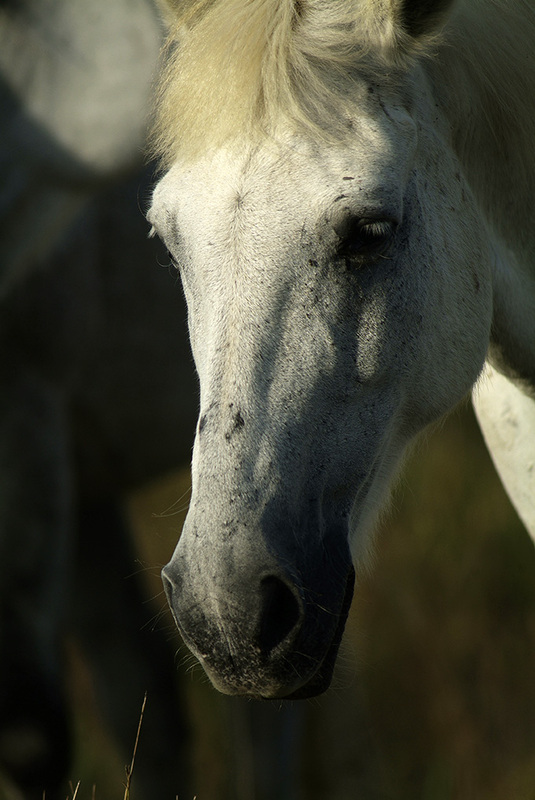 ...we were dumbfounded to find a herd of the horses of the Camargue, the wild horses of the Camargue, gathered right by the side of the road. We pulled over and approached quietly, not wishing to disturb the sleep of those that leant towards each other, nostrils turned away from the saline sea winds. They have been in the region for as long as man, possibly since the Paleolithic period. 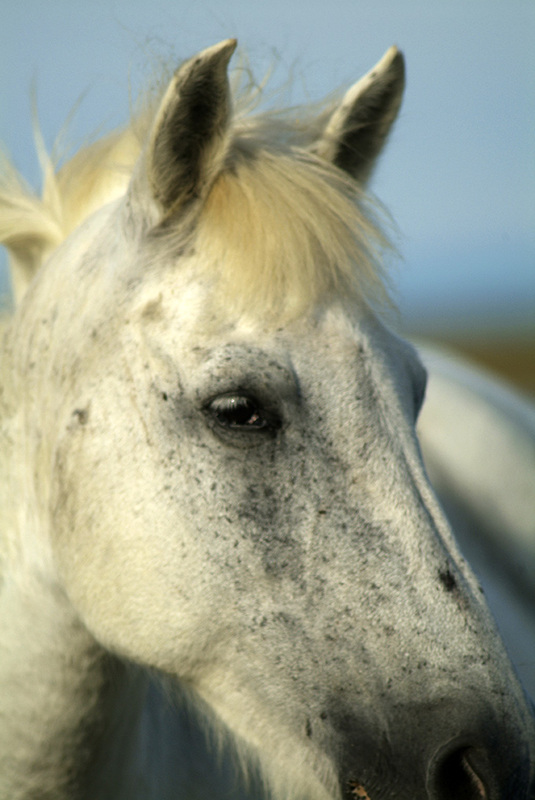 It is believed that they were cherished by the Romans and indeed Remi told me that Julius Caesar's cavalry was composed of not Italian but rather French (then German) riders. Why not think then that he was fond of this sturdy strong breed? It is known that later kings of France would forcibly take riders and these steeds and haul them into combat. The Brotherhood of the Gardians was formed over 500 years ago to end that practice and yet the riders are still practicing their skills today as France's cowboys in herding the wild bulls that also roam this delta - half-sea, half-land. But there were no sun-worn ranch-hands about, just these stately figures on an open plain. They let us observe them and most likely could sense our admiration; these creatures so ancient that they could nearly be ghosts from another time, were it not for their cut short snorts and rippled muscles moving under their white coats covering deep black skins. Heather these are truly magical moments to cherish! I thank you for sharing with us!! Heather, the photos are beyond beautiful. Made my day. Thank you so much. Wow!!!! What a gift - I can't believe it! They are so beautiful, and I enjoyed reading their history. It is clear that they trusted you and Remi, for they do have that sleepy quality - not an "on guard/watch out!" vibe. The photos are so wonderful - the first one is UH-MAY-ZING - their faces together are heart-shaped! And I think the fact that you have some experience with horses shows in these photos and maybe helps explain why they were so calm around you (and your experienced-aroung-wild-animals boyfriend). Congratulations - we are so happy to experience this through your beautiful photos and words! How exciting! Your beautiful pictures say so much of their personality. Yes, gifted you and Remi were/are! 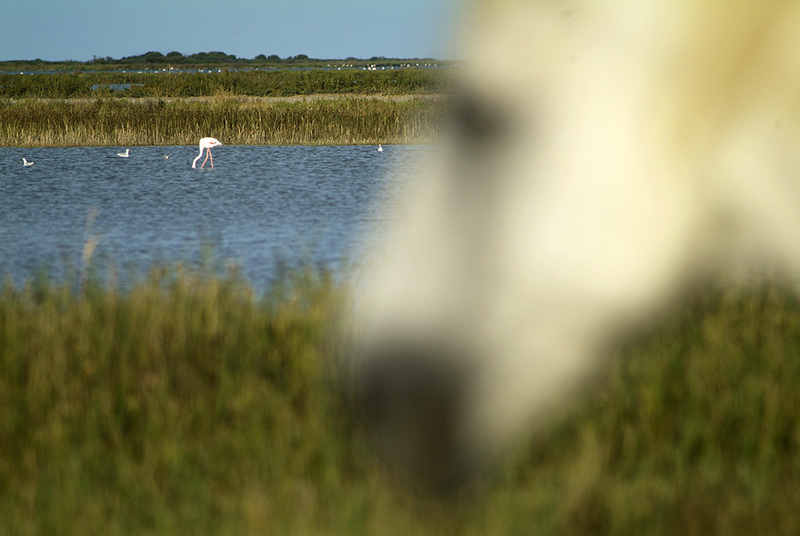 It is almost as if they were waiting for you so that they could say their goodbyes and make sure you did not forget your time in the enchanting land of the Camargue! Your words and images are gorgeous. What an astonishing experience! 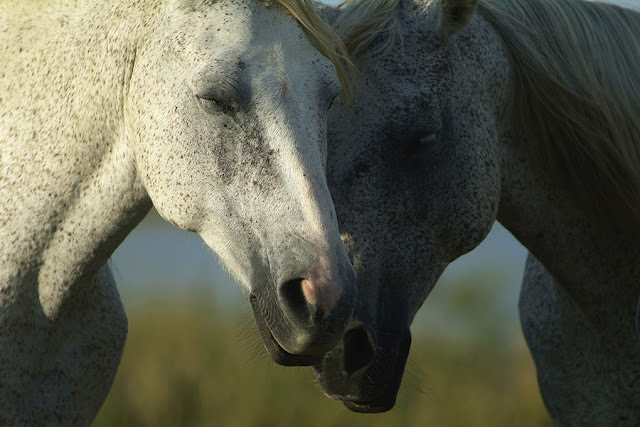 Magnificent animals, your not-so-wild horses. Heather, these are stunning images. You are so talented. I recently saw the film White Mane. Have you seen it? I have seen clips from it, Jackie. I need to see the whole thing! Especially as it is a short film, isn't it? 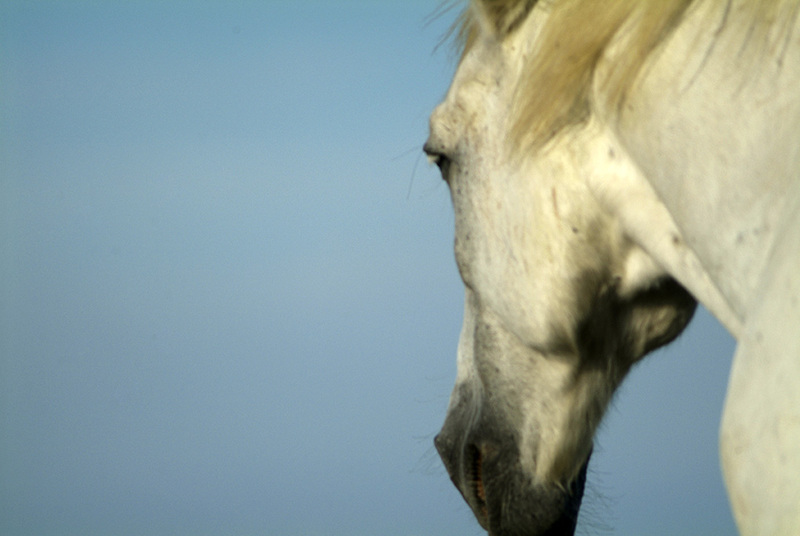 It has always been a dream of mine to see these horses, such magnificent creatures. 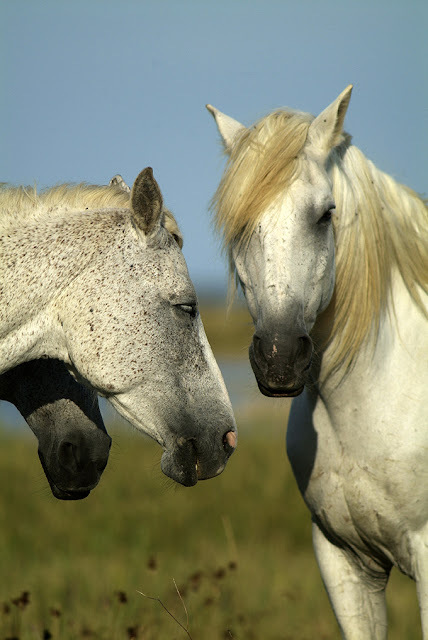 One day, I hope I shall..
NO surprise to me they did not run!They know a GORGEOUS RED HEAD when they see one!You were NOT a threat to their gorgeous BLONDE MANES! That was an awesome encounter. The horses look so majestic. I know I would have loved to touch them but I also know they would have shied away if I tried. The pleasure of an afternoon gathering together the lovable horses with their “ancient" graceful movements and playful innocence. A gift to you, from you to us. What a unique experience! Look how beautfully you tool advantage of it. Stunning photos you will treasure for years. Spectacular photos! They truly convey what it's like to talk to a horse. No I'm not drunk and yes I meant to write that. I think you'll know what I mean.